In this article we will cover the most important information about two absolutely necessary engineering systems for a private house. These are water supply and sewerage systems. The first one ensures the supply of clean water to the house, the second, on the contrary, removes the wastewater. Let’s have a look at each one of them separately. WHY ARE WATER SUPPLY AND SANITARY SYSTEMS CONSIDERED TO BE ABSOLUTELY NECESSARY? The system is responsible for supplying water to the house 24/7. In order to achieve it, people install different equipment for pumping, storing, cleaning, limiting and supplying water to the house. The first step is to choose the source of drinking water — it can be a borehole, a well, or a general city water supply. A well is easier and cheaper to implement, but a borehole can provide us with pure water (in other words, artesian). In addition, a borehole provides mostly unlimited supply of water, which cannot be said about a well. If to count in a very general numbers, we can say that a borehole in just one hour of time can provide you with such amount of water, which for a well will take a day to provide. Well, we are good with the sources of water, now it is a high time to take a look at the equipment for supplying water to the house — the pumps. Pumps can be of two types: surface mounted or submersible. Even from the names themselves we can figure out their principles of work – surface mounted pumps supply water from the upper layers, submersible ones – from more significant depths. Another absolutely necessary element of the water supply system is a water supply network, which includes wiring and final destination points. Sewage system is responsible for the diversion of wastewater into special treatment facilities (septic tanks) and its purification there. When installing a sewage system, it is highly important to take into account the location of the equipment, as well as the distance between the water pipe and the sewage system itself. Since the sewage system affects the state of the environment, its misplacement can be prosecuted. Therefore, in order to protect yourself from any risks, it is better to leave this work to professionals who will take into account all the important moments and even minor details. Project development for water supply and sewage systems is an indispensable process for efficient operation of equipment, since in this process professionals take into account and think through all the important aspects and smallest details of the future system. While selecting equipment for water supply and sewerage systems, it is highly important to remember that the main thing in all the process is the right concept. Only the right choice of the concept, the correct project design, the competent selection of technology, materials and cross-section of pipes will result in a high-quality water supply and sewerage systems. The first ones can also be noise-proof or not. For the sewerage system, in order to remove the any smell and create a vacuum in the sewage pipe, the best choice are fan risers. 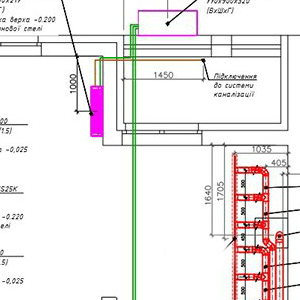 It is highly important to make a good sound insulation of the pipes for these systems, especially in places where sewer pipes pass through the bedroom; correctly select hydraulic pipes, depending on the mixer and throughput of the particular pipe; thoroughly calculate placement and length of fan tubes; correctly install and center out the outlets for the mixers and so on.